+1 Entrepreneur Interviews celebrate Fort Wayne area entrepreneurs who deserve an upvote. This post celebrates Own Your Success, a non profit that supports women who own businesses. Like many, she started her career with a job. She worked with national printing company, Mossberg and Company, where she repped the Levis account. “It’s just what you do — go to school and then get a job.” Fortunately for Andie that job at Mossberg enabled her to cultivate her love for paper products (yes, Andie is an admitted paper geek). The switch in mindset toward entrepreneurship occurred when Andie faced off with cervical cancer. That sort of illness will cause you to think a bit more deeply. For Andie, that meant being intentional about what she wanted to do with her life. That thinking spawned her own business. 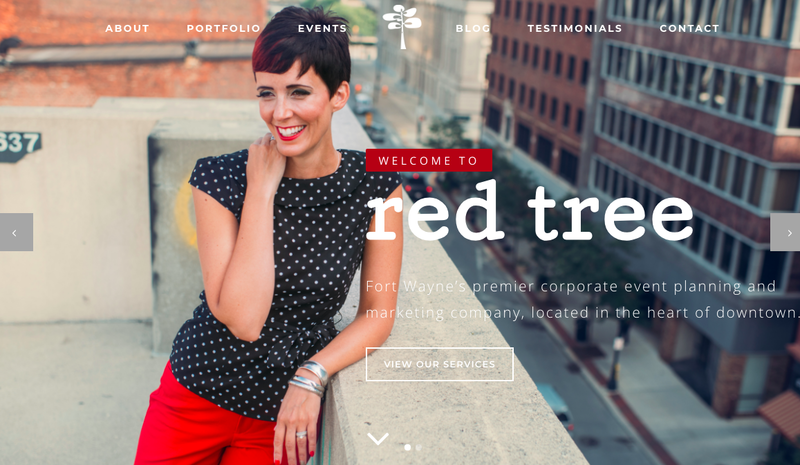 “I knew I was going to start my own business, and I knew it would be called Red Tree, but I didn’t know what it was going to do.” Red Tree started as a print broker, but quickly evolved to become a full service marketing agency with special expertise in event planning. One day, Andie was on a walk around the lake, when she started to tally all of her girlfriends who also owned their own businesses. She quickly got to a count of 16 and thought, “I should invite them to lunch together! They can get to know one another.” Andie booked Club Soda and invited the 16 to lunch. They invited friends and 30 people showed. Everyone brought something from their company to give away, they had lunch, and they did some speed networking. When it ended, everyone asked, “When’s the next one?”. 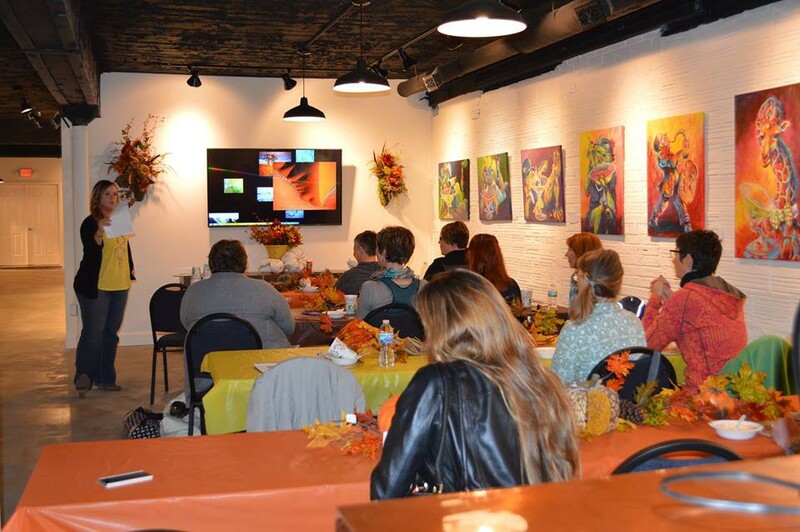 The second event was at Choice Design — and 60 people showed up! Andie thought, “This needs to be a thing.” And, just like that, Own Your Success was born. 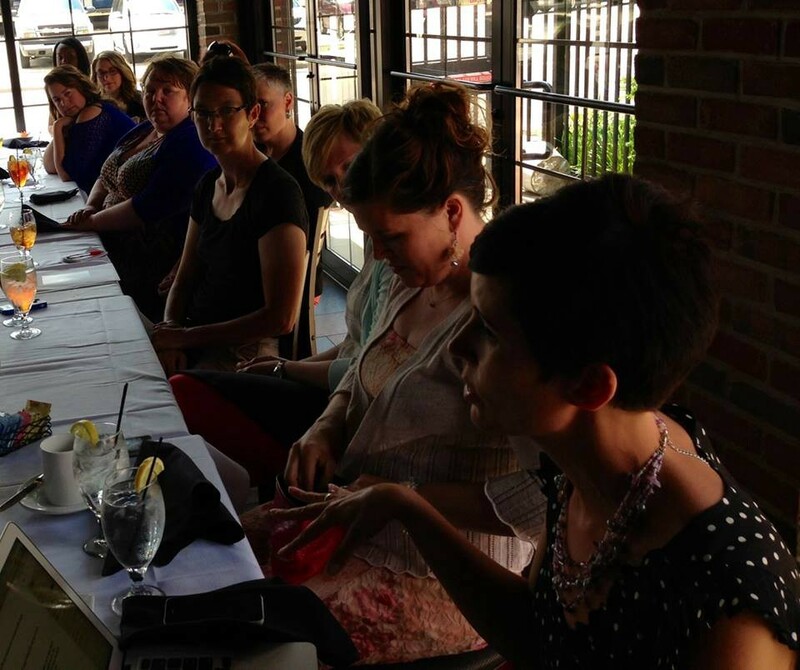 Andie started quarterly programming and a Facebook group (it’s a secret group, so if you are a woman business owner, connect with Andie and ask to join). A core group of true believers helped kickstart OYS. Jennifer Ford of Choice Design, Laura Stine, and Anne Marie Labenberg all helped spread the word, create ideas for programming, and grow the excitement. Since the first informal lunch in September, 2014, the programming has grown to include multiple programs in a month, and members post multiple times each day to the Facebook group. I don’t mean to make OYS sound like just a group that gets together for lunch every so often — that’s just how it was born. Its mission is quite serious and very important. As Andie says, “Like everyone new to entrepreneurship, women don’t know the ins and outs of starting a business. 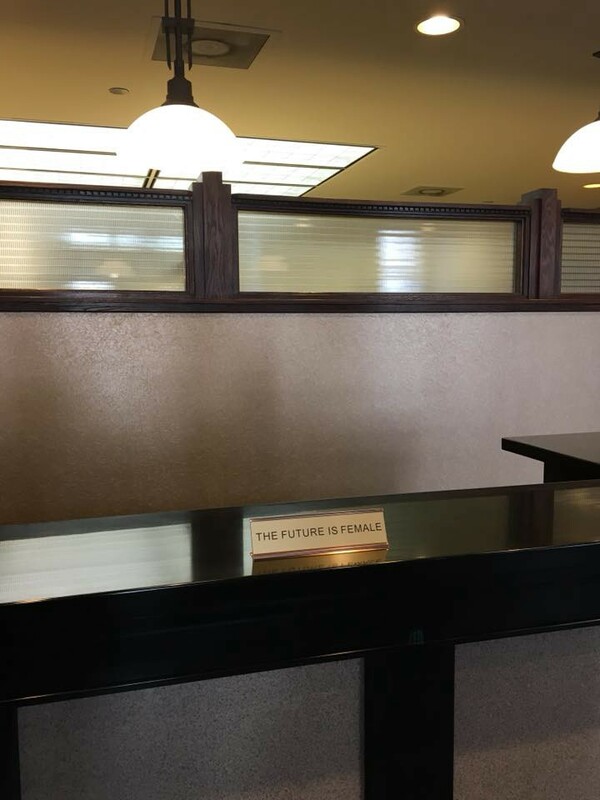 But, because of the smaller number of women entrepreneurs in our community, we also don’t have as many examples or mentors.” Recent statistics report that only 5% of entrepreneurs in Fort Wayne / Allen County are women. Moreover, although OYS is “not the she-woman man-haters club”, it recognizes that an unspoken bias, male privilege, absolutely exists. Being accepted as credible is definitely a greater challenge for women entrepreneurs than for men who similarly own businesses. Consider the cringeworthy term “mompreneur”. Cringeworthy (and an example of male privilege) because you have probably never heard someone say “dadpreneur”. Solving these challenges is OYS’s raison d’etre. Andie explains Own Your Success’s strategy like a layer cake (gluten free, of course). Layer 1 — Physical Community. OYS, at its core, exists to move the needle and grow the number of women entrepreneurs in the region — and to help the community of women entrepreneurs interact. Layer 2 — Online Community. OYS’s online platform allows members to connect, socialize, learn, and grow wherever and whenever — when they can’t be together in person. Five weeks ago the online community was threatening to cross the 300 member milestone — in those five weeks it has grown to 350! Programs and events bring members together physically to connect, socialize, learn, and grow. OYS holds a regular Book Club for professional development, arranges coaching like the series recently produced by Wilcox and Associates, and produces events featuring industry experts like the recent business funding event produced by PNC Bank’s women’s banking division. Here’s a real world example of how tribe works for OYS. At the recent 5th Annual Women in Politics Forum, a lady in the audience asked the speaker during Q&A, “I own one business, and I’m starting another. I need a community. How do I find that?” The speaker invited her to turn around and meet Andie sitting right behind her at the next table — an OYS table sponsored by an OYS member. Boom! OYS has two exciting goals on tap for the next year. First is the launch of a brand new paid membership model, bolstered by a new public-facing website with a deeper level of member-only content and engagement — plus other member benefits. The Facebook group will continue to exist and be free, but greater value will accrue to paid OYS members. Second, OYS is planning a physical space, called Hummingbird. “A place where we can work together, be together, and succeed together every day,” the ultimate manifestation of community. It is planned to have dedicated offices, some open coworking space, a conference room, and an event space (for programming produced by OYS, its members, and the community at large). OYS has left a marker at a site being scouted for Hummingbird. Fun fact. You probably didn’t know that in Pacific Northwest Native American culture, Hummingbird symbolizes “the inner peace and confidence to move forward in your goals.” Perfect! Further into the future, Andie intends to grow OYS throughout the US, expanding community across the country. The first few satellite locations will probably be in Ann Arbor MI, Columbus OH, and Chicago IL due to OYS’s existing connections there. We can’t wait! Ask Andie who she admires locally and she answers with people and companies that give back to the community. That makes perfect sense, since Andie has run and grown OYS since 2014 strictly as a volunteer, often out of her own pocket [can we give HER some applause, everyone?]. Here are some of the people Andie admires. Marilyn Moran-Townsend of CVC Communications, because not only is she successful in business, but she also gives so much work to support other businesses. Rae Pearson of Alpha Rae Personnel, a phenomenal success story and a huge public supporter. Dave Sanders of Start Fort Wayne, a community innovator who does groundbreaking work to grow the entrepreneurial community. Matt and Nicky Nolot, for creating Tolon, a restaurant with a unique and delicious menu that uses as many local ingredients as possible. Anne Marie Labenberg, for speaking nationally about the under-discussed topic of maternal mortality (of which the state of Indiana is an embarrassing 47th in the US).